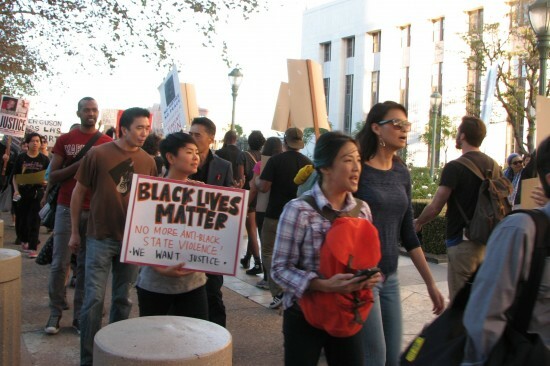 Do Black Lives Matter to Asian Americans? You are at:Home»English»Columnists»Do Black Lives Matter to Asian Americans? Since the announcement of no indictment for Darren Wilson, the police officer who murdered 18-year-old unarmed Michael Brown, nationwide protests in every state have shown the outrage over what has happened: Another black life has been taken by law enforcement with no accountability by the justice system. Only a few days after this news, Cleveland law enforcement shot and killed 12-year-old Tamir Rice, another unarmed black youth. Then, we learned of another grand jury’s decision to not indict the police officer that murdered Eric Garner, a black father of six children. The data and statistics show that every 28 hours, a black life is taken by a security officer, police officer or self-appointed vigilante. And with each black life lost, we always lose the opportunity to hear their side of the story. Instead, we hear the side of Darren Wilson, who appeared on ABC in an interview with George Stephanopoulos, where he stated that he had absolutely no remorse for taking the life of Michael Brown. This sort of clear-cut conviction serves the purpose of convincing the public that there is no anti-black racist problem with the police. Moreover, it aims to blame the murdered black lives who will never have the opportunity to share their fear, their love, and how much they had to lose as beloved friends and family members. From Trayvon Martin of Florida, Renisha McBride of Detroit, Ezell Ford and Deshawnda Sanchez of Los Angeles, the list of names of murdered black Americans keeps on growing. In downtown Los Angeles, a group of about 30 Asian Americans gathered to participate in a protest the Wednesday before Thanksgiving. Signs included messages such as “Black Lives Matter” and another that read “Remember Vincent Chin.” Like Michael Brown’s case, Vincent Chin’s murderers were protected by the justice system. They received no jail time, but only three years of probation and some minor fines. Vincent’s life was taken in Detroit in 1982, during a time when anti-Japanese sentiment was rising due to deindustrialization and the competition of Japanese automobile manufacturers. Vincent was mistaken as Japanese American and murdered days before his wedding. The injustice of his death was a spark for the Asian American movement, where many Asian American activists drew their inspiration from how black Americans struggled for civil rights and liberation after centuries of oppression. However, we need to draw clear contrasts in the comparison between remembering Vincent Chin and Michael Brown. While hate crimes continue to exist against Asian Americans today, our bodies are not viewed in the same “life-threatening” light as black bodies are in the U.S. The narrative of “demonic” black masculinity is an ancient, yet continuing trope that many Americans still retell, believe and use as rationalization for murdering and policing black lives. Black Americans make up 1 million of the 2.3 million people who are incarcerated in our prisons. In turn, the public view of Asian Americans has shifted to see us as the “whiz kids” who excel as “the model minority” in education and many aspects of life, which falsely blames communities of color as the fault for their own oppression. Despite the fact that many Southeast Asian, Native Hawaiian and Pacific Islander communities are also heavily targeted and impacted by the criminal legal system, the model minority myth makes these issues seem invisible to the public. The myth is a double-edged sword that calls on Asian Americans to dismantle its ability to divide us from other communities of color. In its ugliest form, the model minority myth translates into anti-black prejudice that pervades the culture in our own families and communities. How many of us were raised with or know JA families who use the derogatory word “kurombo” and perpetuate messages that it would be a disgrace to ever date or marry black Americans, let alone have black friends? Think of the real-life impacts these messages have in our community. Not only does anti-black prejudice desensitize many of our family members from understanding the horrors of black struggle in this country, but it also harms and excludes the growing numbers of mixed-race black and Asian people within our community. Times like this call for us to reflect on what can we do to humanize the experiences of our black neighbors, friends, and family members. As Asian Americans, will we be complicit or resistant to the onslaught of anti-black state violence? There are no easy answers or solutions, but more of us can make vigilant efforts to debunk any anti-black racist ideas that are part of the problem. Each of us has the capacity to learn more if we self-educate ourselves on black historical and contemporary struggles, as well as the significant contributions that the civil rights and black liberation movement has given to all of us, including Asian Americans, to benefit from. We can take lead from black leadership on how to help, and strategically leverage any influence we have to be in solidarity. We can show up without sharing that we too, know pain, such as the lost life of Vincent Chin and countless others, but because we know in our hearts that black lives matter. The Black Lives Matter movement requires each one of us to decide which side of history we will help to write. Let us remember that when our society genuinely respects and acknowledges that all black lives matter, we will see our country transformed into a more just place for all of us. Traci Ishigo is a 23-year-old community organizer living and working in Los Angeles. She can be reached at [email protected] Opinions expressed do not necessarily reflect those of The Rafu Shimpo.